Event Script PHP is a responsive and mobile friendly web script that is easy to be included into a page of your existing website. Administrator and visitors will be able to add/submit events. Admin is able to approve and manage all the events, and customize the feel and look of the script. Current stable version of Event Script PHP is 2.0 (major version - April 01, 2018). Updates log. Well designed admin area will allow you to manage events, categories and options. Create categories and organize your events. 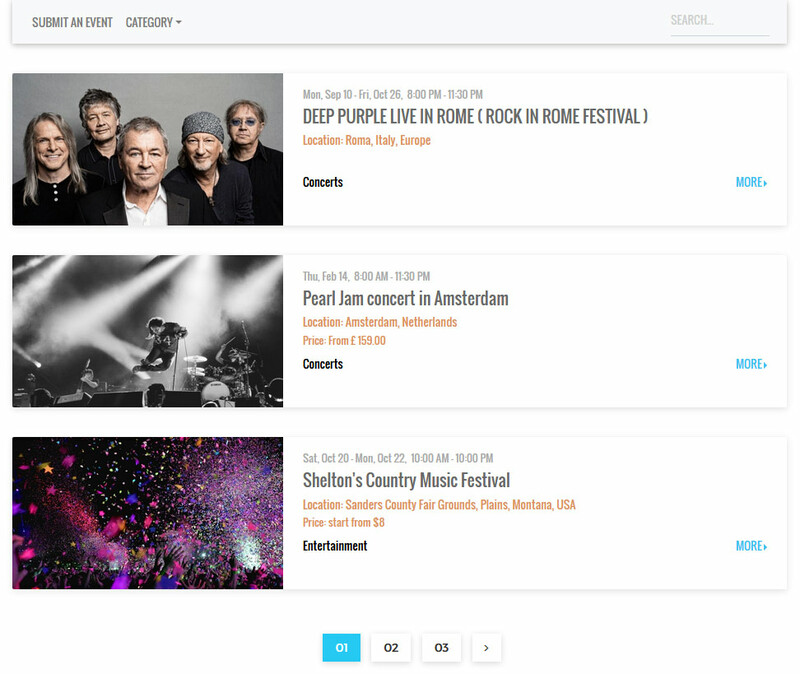 Help visitors easily find categorized event. Readers will be able to search and find the exact event from the list of results. Script automatically generate meta tags, so searching engines will find events easily. You can optionally allow visitors submit their events. Admin approve before having them listed. The script automatically generate RSS feed, so readers could subscibe and show your events on their websites. At the bottom of each event visitor will be able to click and share in their favourite social media.